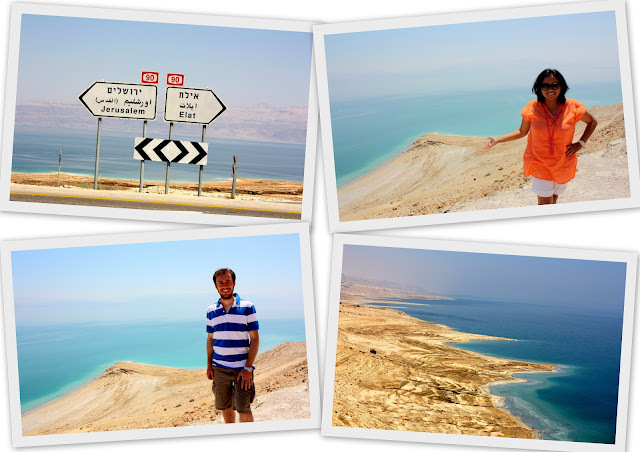 After a history/culture packed 4 days in Jerusalem, it was time to head south to the Dead Sea! 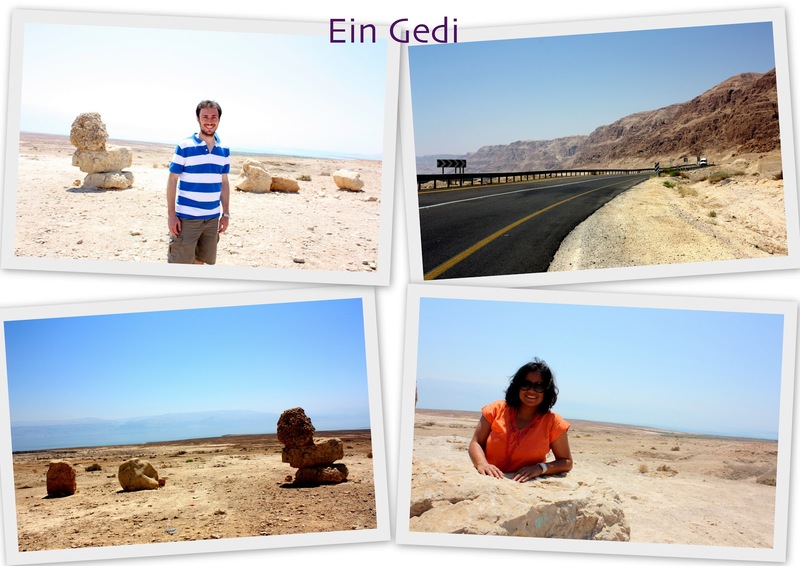 We rented a car for the remainder of our trip and headed towards Ein Gedi, an oasis in the Judaean Desert, close to the Dead Sea. Accommodation options are quite limited and the most popular place to stay is the Ein Gedi Kibbutz. The kibbutz offers three meals a day and as there are no other restaurants in the area, you have no other choice but to eat here. Luckily the food was great!It took about 2 hours to drive from Jerusalem to Ein Gedi and it was great to drive through the desert. It brought back fond memories of our trip to Jordan in 2008 and although the Israeli part of the desert is nice, I found the Jordanian one a lot more beautiful and scenic. As part of our accommodation package, we were given passes to the Ein Gedi Kibbutz's private beach where we could cover ourselves in the dark mud full of minerals and float in the Dead Sea. It was incredibly hot (about 42 degrees celsius!) and so the idea of "chilling" at the beach was very enticing! So we quickly packed our towels, a sarong, swimwear, beach slippers and sun block lotion and drove to the private beach (about 3km from the hotel). At 423 metres below sea level, the Dead Sea is the lowest point on earth. It is not actually a sea but is a salt lake that is bordered by Jordan to the east and Israel and the West Bank to the west. With 33.7% salinity, it is one of the saltiest water bodies on earth. Just imagine, it is 8 times saltier than the ocean! Due to its high salinity, it is impossible for any fish or aquatic plants to survive and hence it is named the Dead Sea. The Dead Sea is known worldwide for its health benefits due to the minerals present in its water and mud. Therefore many people who seek relaxation or are recovering from an illness come here to enjoy natural therapeutic treatments. 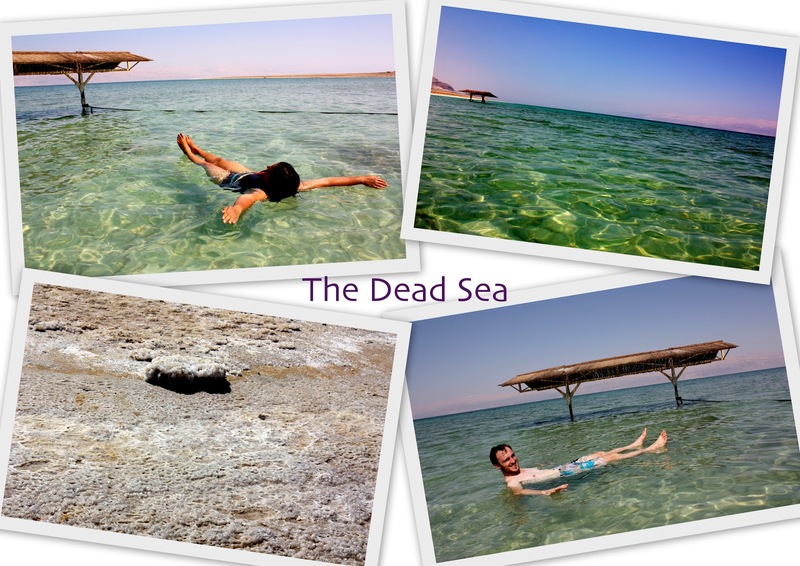 We had heard so many stories of people floating in the Dead Sea and we wanted to test and try it out ourselves! The high concentration of salt and other minerals cause the Dead Sea to have high density and therefore even if you try to swim, you just can't! You'll end up floating almost immediately! Once we got to the Dead Sea, we were dying to cool off from the scorching sun and couldn't wait to get into the water! My, how wrong we were! Surrounding the water was solidified salt crystals, making it a very hard and rough surface to walk on. We were grateful that we had our beach slippers on as walking barefoot can be extremely uncomfortable and painful. What a shock we had when we first set foot into the water! It was not cool and refreshing! It was boiling hot! From the moment we got in, I felt my body starting to itch and burn everywhere! It was so painful to be in there the first few minutes, almost unbearable. But it truly was amazing when our bodies just started to float and we had no control over them! It's impossible to stay in the Dead Sea for more than 15 minutes so we got out pretty soon. We did go back again the following day and fun again! 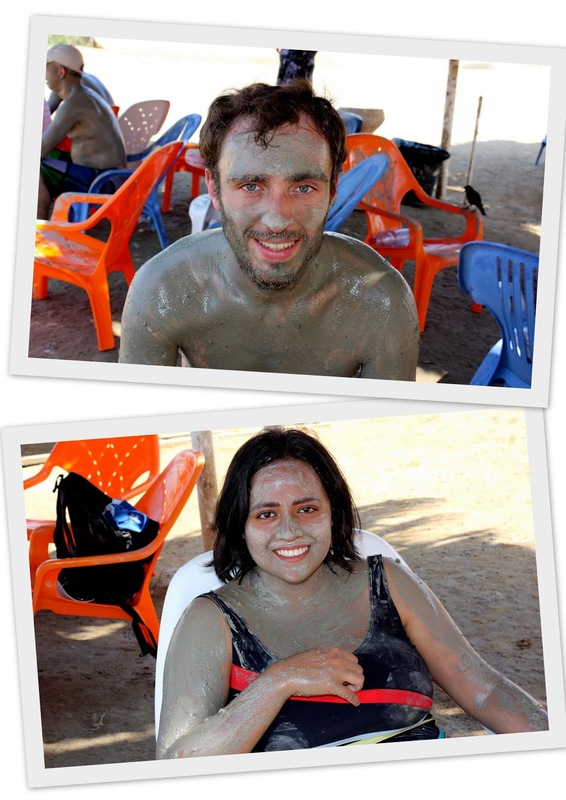 After our unique Dead Sea experience, we went to the mud spa. It is so smelly with the sulphur smell but we didn't really care and covered ourselves in the dark green mud. We let it dry for 15 minutes and then washed it all off! It was pretty fun! We had a great time in Ein Gedi and the Dead Sea - a truly unique experience! We bought a few bath products for home and have been enjoying the great mineral soaps and shampoos! It was a nice way to relax after walking so much in Jerusalem so, if you do plan a trip to Israel, finish the hectic stuff first before coming here! Truly an amazing experience, very cliché to float on the dead sea, but unique! First time I am reading a post on Dead Sea and seeing its pictures. I had heard a lot when i was in school .